Resurrection Mary is based on the most famous ghost story in Chicago’s history. The movie sticks to the most basic elements of the tale. Mary, a young Polish girl, was killed in the early 1930’s. She was coming from a dance at the Oh Henry with a date she wanted to get far away from. Mary was then hit by a car and the driver left her there to die on Archer avenue. Mary’s parents buried her in Resurrection Cemetery in the white gown and dancing shoes she wore that night. There have been sightings of Mary since then on Archer Avenue, some claiming to see her on the road and others saying they had her sit in their car upon her quickly disappearing without so much as a door closing. She has even been mistaken for other girl’s named Mary who fell victim to a similar situation around the same time, although many of these have proven to not be Resurrection Mary. The movie made a few changes such as Mary dying in 1938 rather than the early 1930’s and made her date drunk and abusive the night of the accident. Jeff (Schmidt) has been wanting the girl who just seems to be out of his reach, Karen (Herrera), for quite some time now. With the homecoming dance right around the corner, he thinks this might be his chance. Unfortunately, she is already going with her boyfriend, Kevin (Schuetter), the school’s jock and all around jerk. Worse, his best friend, Curtis (Marquette), will be there with his girlfriend, Erica, and they have all been invited to Kevin’s party after the dance. Jeff really doesn’t want to go alone, but doesn’t know what else to do. While driving his car at night, he runs in to a blonde girl dressed in a white gown. She says she was at the Oh Henry dancing with a date that she just wanted to get away from. Jeff gives her a ride home, but she only lets him get as far as Resurrection Cemetery and insists on walking the rest of the way. He does see her again and she agrees to go to homecoming with Jeff and says she will meet him there. Everyone is impressed by Mary, especially Kevin. While at his party, he is extremely drunk and continuously hits on her, causing Jeff to fight Kevin. The next day, the police show up at Jeff’s house, accusing him for the murder of Kevin. His grandmother, Lois (Kirkland), tries to protect him in every way that she can. As more people in Jeff’s life start dying off, including the best friend he has ever known, he becomes the primary suspect and the police are determined to lock him up and prove him guilty, even before they really have all of the evidence. Lois believes that Jeff’s Mary is Resurrection Mary. There are definite similarities between what Jeff knows about her and the legends of the ghost. Jeff is still hesitant although there is definitely something very strange about Mary. He sees her again and Mary insists that she hasn’t killed anyone. Of course, when he tells the police a legendary ghost is the real murderer not him, he is merely laughed at. Mary may have had just as much to do with his past as she does with his present. His parents were killed in a car accident on Archer avenue, just as Mary was. The mystery is that out of everyone Jeff is the one who made it through without so much as a scratch. If Jeff can’t find out and prove the truth that happened to his family and what is happening to his world now. he will end up in jail while everyone else continues to die, possibly including Jeff himself. The acting was pretty good for an independent horror film. Kevin Schmidt was easy enough to relate to and feel for as our protagonist. Pamela Noble does very well as Mary. She is beautiful, charming, yet shy and very mysterious. She gives us just the right presence, we are not really sure whether she is the right girl for Jeff or if she is a complete monster. Even if she is a monster, it isn’t beyond us to see things her way. Kevin ends up dead and Mary said everyone gets what’s coming to them in the end. Kevin was drunk and tried to take advantage of her just like her repulsive date did the night of her murder. Kevin hurt Jeff too so if Mary is the one responsible for killing him, it is to protect someone who was good to her or an attempt to defeat her own demons. Noble does a terrific job of creating suspense and mystery by the contradictions she gives us. She makes Mary both seemingly innocent and sweet, chilling, and scared at the same time. Of course, Sally Kirkland, the veteran actress that she is, did wonderfully. She seems to be able to do a lot with her roles especially in the horror genre. Here her true belief in Resurrection Mary adds horrifying suspense as well as having much more faith and belief than most in the movie. I was glad to see Sean Marquette in a role where he had more to work with and offer. Seeing him here as opposed to Remember the Daze, he delivers us with a higher standard. His personality was really able to surface in the film as he gave us some great comedic relief. Richard Riehle and Charlie Schlatter did very well as the small minded, arrogant cops. One thing in particular that bothered me was that they didn’t even touch on why Karen stayed with Kevin. This confrontation seemed natural when Kevin had gotten drunk and aggressively hit on another girl all night long, continuing to pursue her. Obviously, if he isn’t already cheating on her, which he probably is, he just showed her that as soon as Mary would give in, he would willingly cheat on Karen. Rather than really being mad at Kevin or even bringing up her feelings of what happened, she seems more loving towards him than ever, right before learning of his death. Even after this, it could have worked in to the script easily. I know there are a lot of girls who don’t have common sense when it comes to mistreated relationships, but not even touching on this made me look down on her and she just seemed like an unrealistic character because of it. Don’t be looking for bloody or gruesome deaths here, because you aren’t going to find them. We don’t see any of the deaths while they are happening, only after they occur. There is some blood, but it is pretty tame. It is obvious that this is more of a take on a paranormal story than a horror film. Resurrection Mary could have been better with better dialogue since sometimes things sound a bit too familiar and forced rather than true to the characters. The film could have gone further, but I am able to accept it for what it is. Resurrection Mary is obviously a fictional account of, as of now, what is still an urban legend. There have been witnesses and it is a highly documented case, but nothing has truly been proven on it. 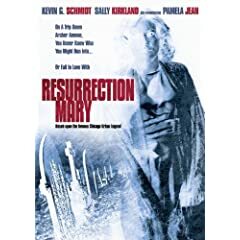 It is clear that the filmmakers didn’t want to stray to far from some of the generally known elements of the story of Resurrection Mary. Resurrection Mary stays true to the legend while telling it’s own version of the tale and giving us a suspenseful and intriguing ghost story.